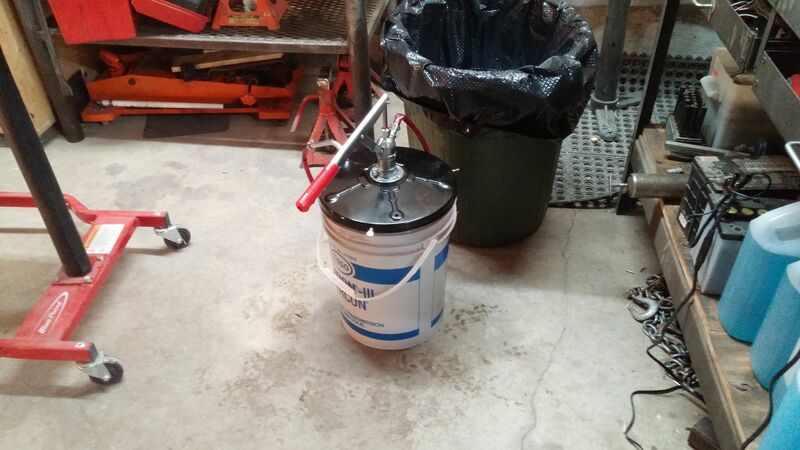 This morning, I cleaned up my pail that I use to pump transmission oil with. 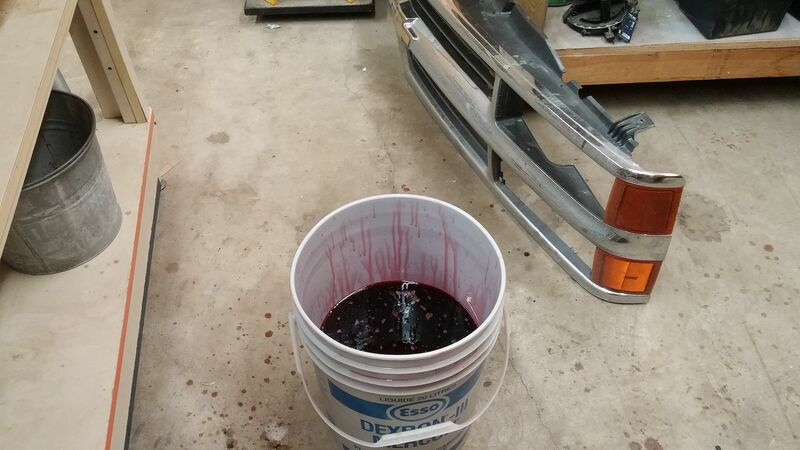 Dumped my oil that I will use into the pail, then pumped the handle some to get the old oil out of the pump and hose. Then I filled the transfer case and 6 liters into the transmission. Then I put the shroud and the fan back in place. Now it was the front drive line that needed attention. I had to use a little bit of heat to get the nut to back off. Marked the distance I needed to grind off. Ground down the splines, then used three different grits of emery cloth to make it as smooth as I could get it. 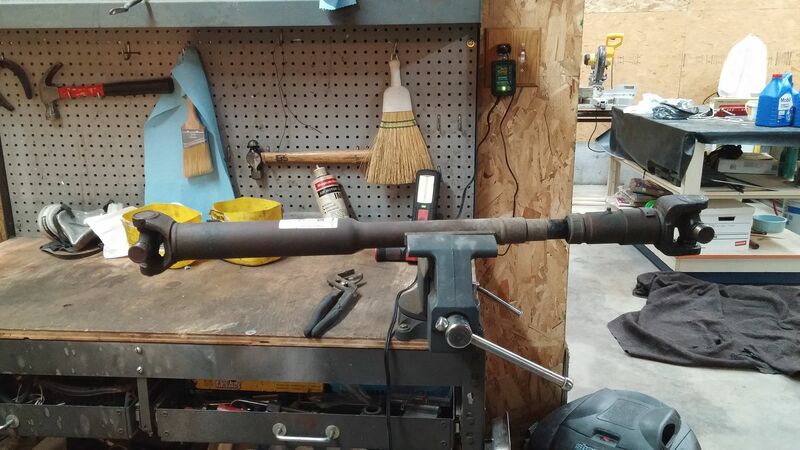 It will not be perfect because I would have needed a lathe for that. Also works better for the emery cloth too. 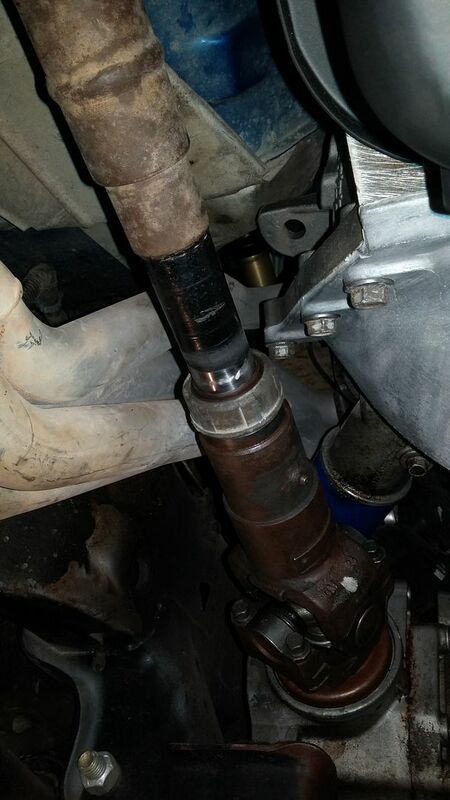 I bolted up the drive line. Once on you notice one item you for got to put on first so you remove one end then put it on again. 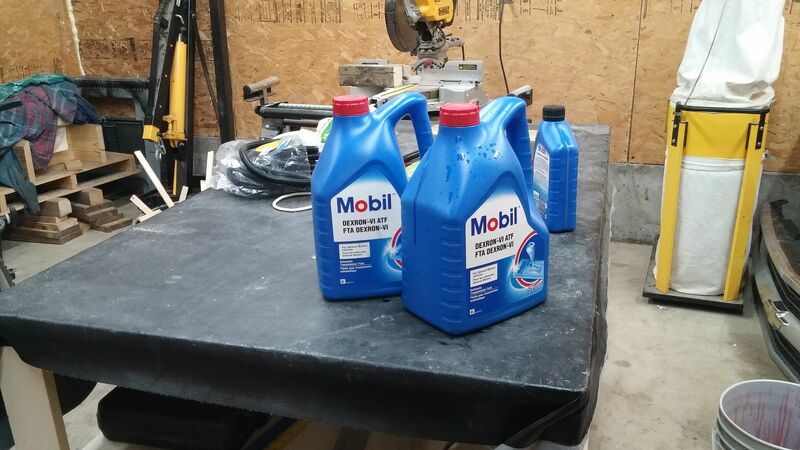 I also just switched to Mobil One synthetic blend Dextron VI trans fluid. 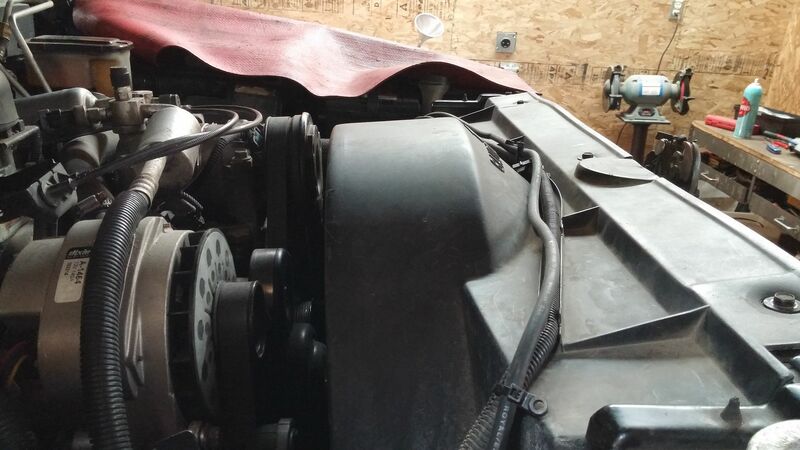 I just did a service on my 1997 Trailbazer with the 4.2 liter inline 6 cylinder rated at 291hp@6000rpm/277lb/ft@4800rpm. These Atlas I-6 engine really pull hard from 5000- red line at 6300rpm. 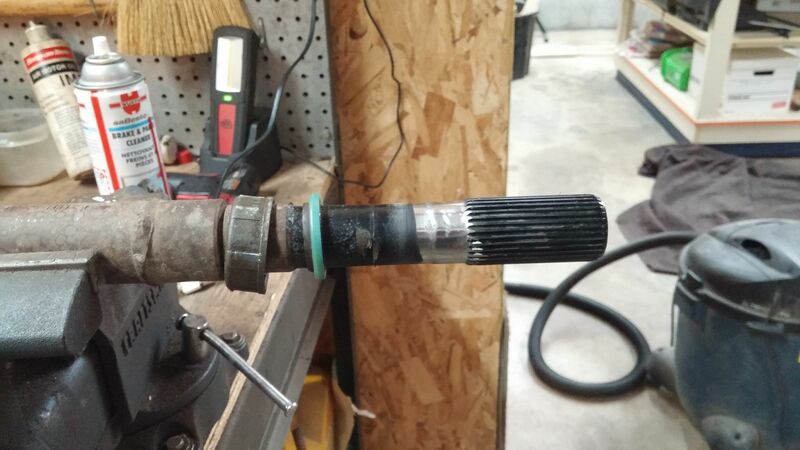 Before my trans service which included 5 liters of fluid and a Delco 60e filter kit, I used to have to manually hold gear in order get WOT upshifts near 6300rpm, otherwise I woukd get a 5800rpm WOT upshift which really was leaving some acceleration on the table. The only issue is that I would sometimes bump the rev limiter at 6300rpm which obviously hurts acceleration. Since my service I can leave the trans selector in 3rd or 4th gear and get solid 6200rpm shifts, EVERY SINGLE TIME. The Mobil One syn blend cost me CAN$38.00 plus tax, and the Deklco service filter kit cost me CAN$48.00. The pan was clean, with the usual clutch material on the pan magnet. It took the full 5 liters to get the stock to read full again. I also saw the full synthetic Castrol TransMax. Its a good product too, but full synthetics scare me in the 4l60e as they were never designed for synthetics, even the new 5, 6, 7 and 8 speeds aren't. Most transmissions built for MY2006 and newer call out for the new Dexron VI ATF, its back compatible for all GM auto trans, even my cast iron 1957 2 speed Powerglide. On my 57 Chev, ATF is called out for use in the power steering system as well. Its a no-no to use the older DEX/Merc III in a 2006+ GM auto trans. I am a firm believer in the drop the pan/change the filter and add 5 liters of ATF method of trans service every 50,000kms. 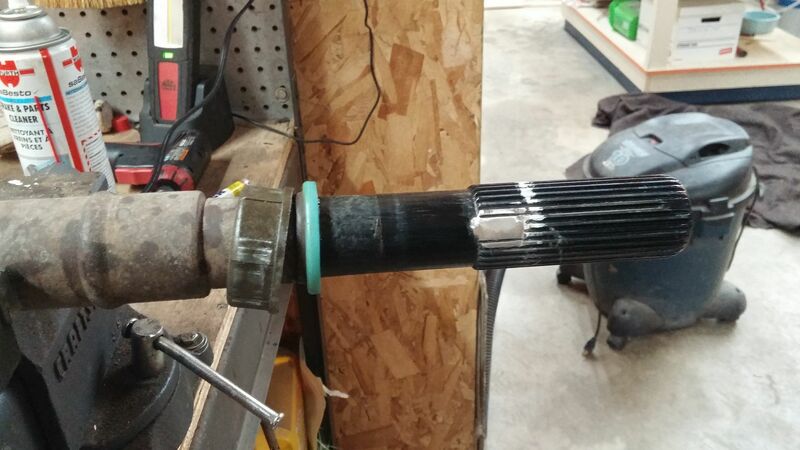 I will never do a power flush, yes it does change all the fluid, but you still have the old filter in place. Last time I did a power trans flush it took out my very expensive 4l60e trans 4-5 kms after the procedure. I performed a front and rear diff service with GM synthetic fluid(mmm Grape scent), and changed out the AutoTrack II blue fluid as well. I think the front dif may have been low, but it only calls for 0.9 liters, so maybe it wasn't low. I', really starting to get pissed off at the Petroleum Suppliers that are selling 4.4 liter oil and oil products instead of the full 5 liters, and are still charging the same price. Same goes for Milk products. A quarter liter is no longer 250mls, a 1/2 a liter is no longer 500mL, and a liter is no longer 1000mL. This is the same for Table Cream, half and half cream, Whipping Cream 35%. Even Cadbury Cream Eggs are way smaller and are no longer using the aluminum foil wrapping, they have gone to a cheap plastic container. Heck Eveb Toblerone has decided to keep the same freaking box, but have added bigger spaces between each triangle in order to reduce the mass of chocolate that you get ineach box. I have no problem with manufacturers making money, but if they need to increase profits simply make the prices higher. DONT ATTEMPT TO DECIEVE YOUR CUSTOMERS!!! Heck even bacon from Schnieders isn't a pound anymore. A pound equals 454 grams, and now the new Schnieders packaging is down in the 300 grams range. This is utter crap and we as consumers need to stand up to this corporate greed. 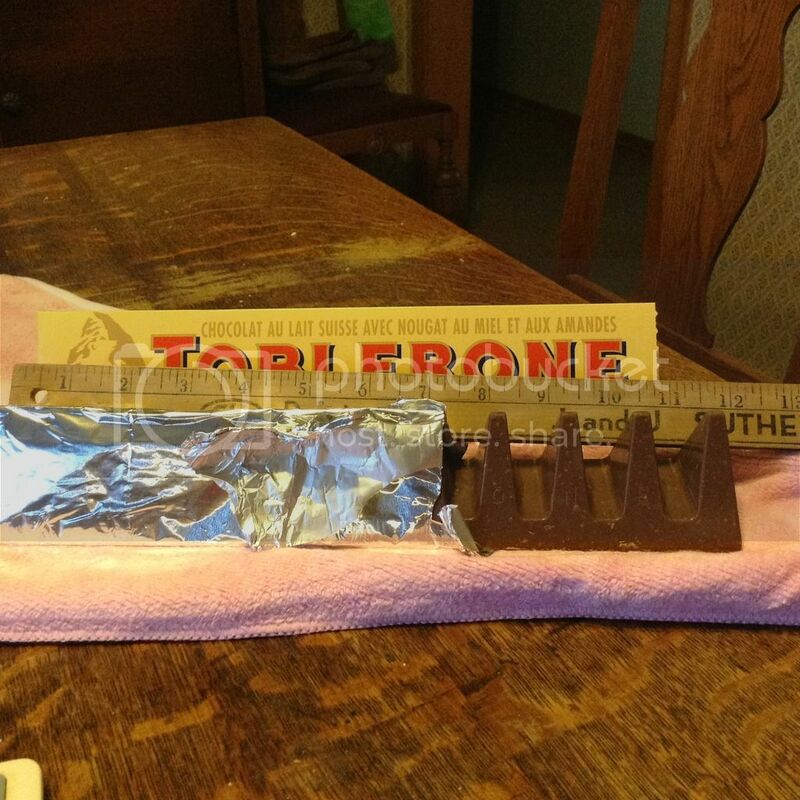 Here's a pic of the newer Toblerone deception. The gaps between each tip of each trangle used to be much closer together. And depending on which country you are in, the spacing is even worse. In England they have an even bigger gap. Again, enough with the deception, increase your prices in you must. And give me back my full 5 liter oil jugs. No engine uses 4.4 liters of oil, esp. with a filter. Hog I totally agree with you,everyone has to make money I understand and have no problem with that but when I get cheated it makes me mad,I would rather pay a higher price than to get shorted!!! The toblerone is one of my favorite candy bar and I noticed the shortage with a increased price last year.😡 Damn it pisses me off!! I do not do a power flush. I have taken out the return line after changing the filter then I run for ten seconds, check fill some oil then run again. Once clean fluid runs out the line, I put it back on then run it to lubricate everything again. I only run it 10 seconds at a time. After putting line in place that is when I see where my fluid level is at then adjust from there. Right now everything is empty except the pan. I dug out my Innovate box to have a look at it. I was hoping to install it at the same time, but it looks like I need to do some read up on it first. Besides with the classes I am taking for my career change and this truck, I just do not have the time to look it over for now. The innovate box you have what is it a data logger or just a wide band? It is a data logger. 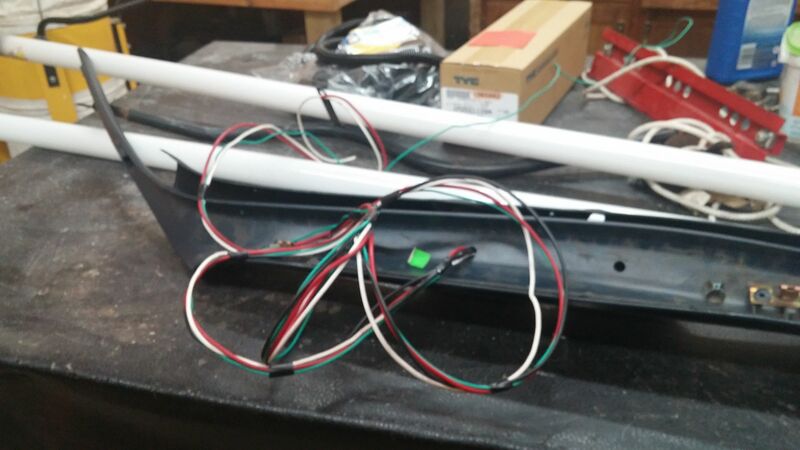 I also have a gauge to put in the pillar pod that I am going to be installing. I will have to read up on this some more so I know what it is about. I need to look over the parts that came in the box. I have another bung in the exhaust pipe on the left side. Just wondering how easy it will be to get the plug I put in out. Rear drivel line done, and it was with in the quote that was given to me. I put it on and it fits like the original except shorter. Pictures later. 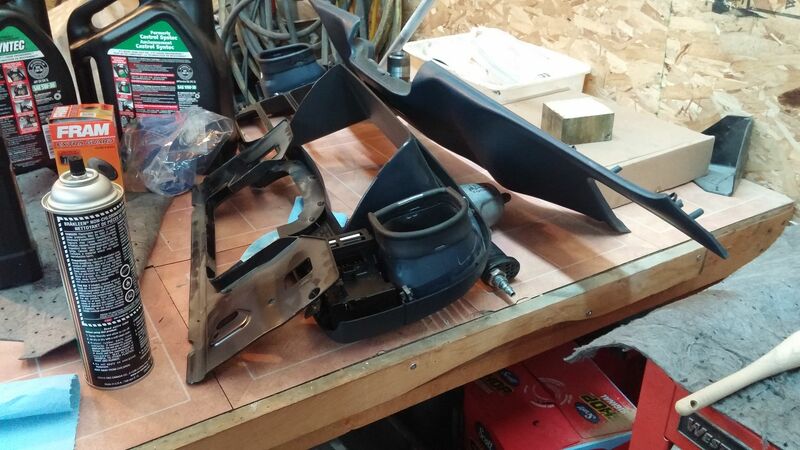 I hope to complete the job on the truck this weekend. I have three days to commit to the job. I have a couple of questions though. I cannot remember if anything was mentioned about adjusting the shift cable? Mine fit on like it was meant to be. The other adjustment I think is needed is the neutral safety switch. What did you do there? It is looking like I have to rip apart the top of the dash to run the wires from the pillar pod. This is going to be interesting since I have never had the top part off yet. Just the front bezel to get at the speedometer to attach my wiring for the 0411 swap. I won't be taking off the piece on the pillar already. 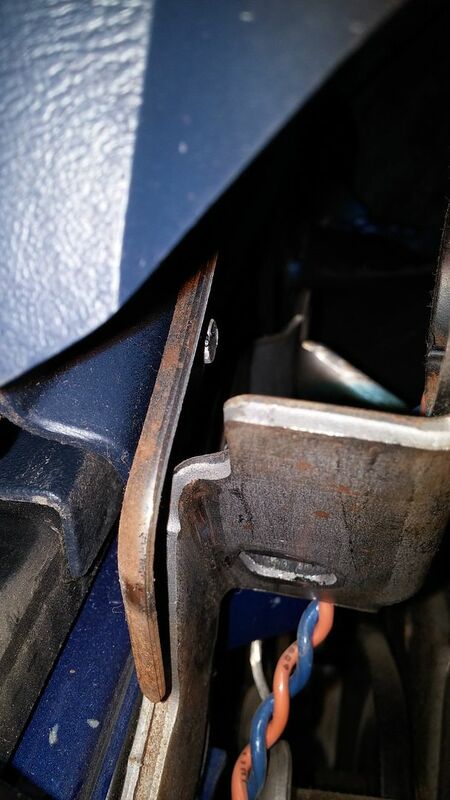 It was removed when our remote starter was installed, and it is sealed with weather stripping glue. May break it. Don't want to do that yet. 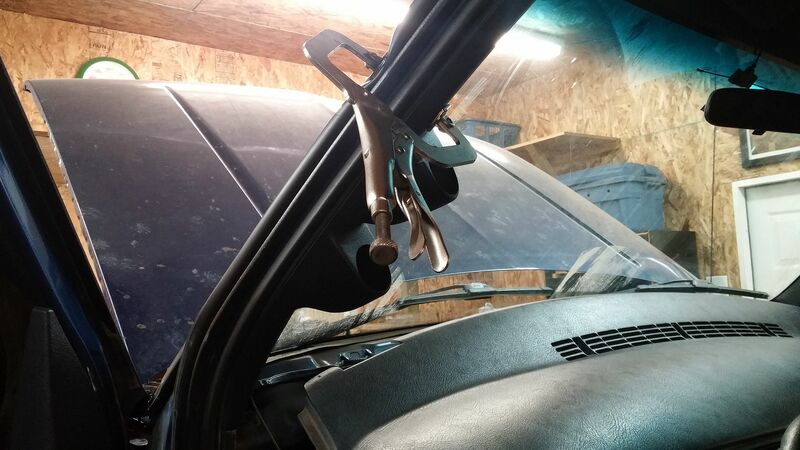 This after noon I have been trying to get the dash to pivot enough to run my wires from the pillar down into the dash. I have mostly everything undone except there feels like some screws still holding it in place. The top three screws really did not do any good they are broke out. Not sure when that happened, I have never take that out before. The only time it may have been done was when we had the remote start added to the truck after we bought it in 1999. I will eventually get it to move. I do not need to take it out just move enough so I can mount the pillar and run the wires easier. Fun when you never have take that apart. The bezel I have had out a few times already. Right now I am watching some videos. Also drinking beer. The latter probably will not help me. After removing the Bezel I removed the lower panel. Objective it to drop steering wheel. I removed the next bracket. Then one more before I attempted to drop the steering wheel I will take more pictures to get a better Idea. I figured out what I was doing wrong. I was able to tilt the dash back out of my way. 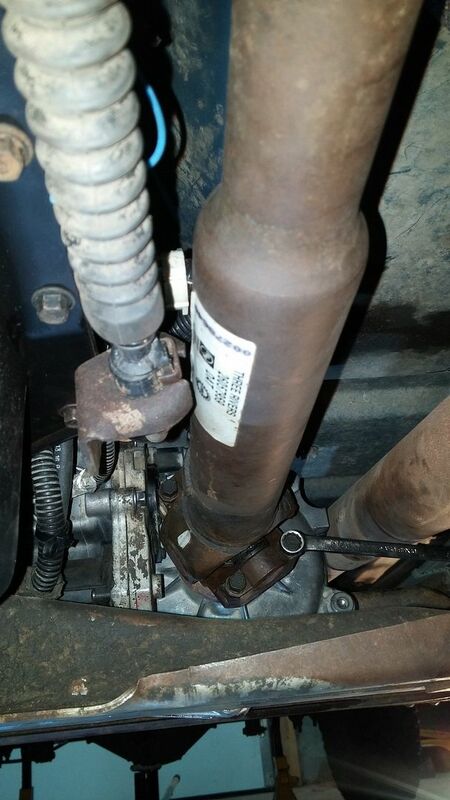 I removed a nut on the right side when I should have loosened off two bolts. Pretty simple. I have a top view of the two nuts I loosened off. 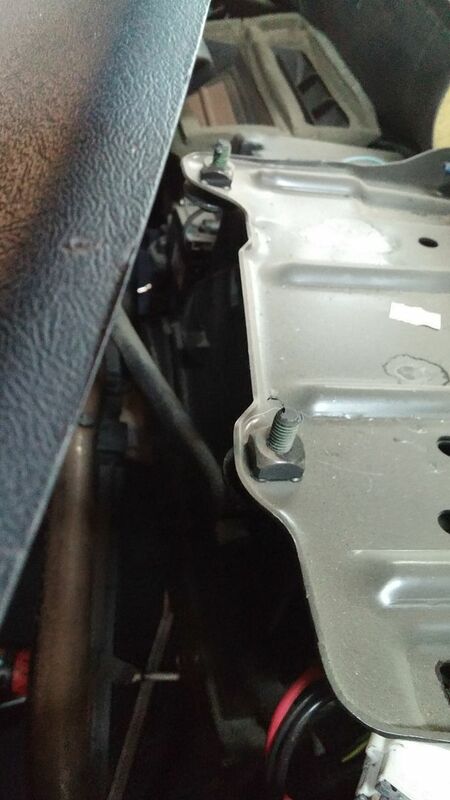 This is a picture of the lower bolt on the right side I removed. It was an 8 mm bolt. This is a picture of the left side area where I removed the 8 mm bolts. 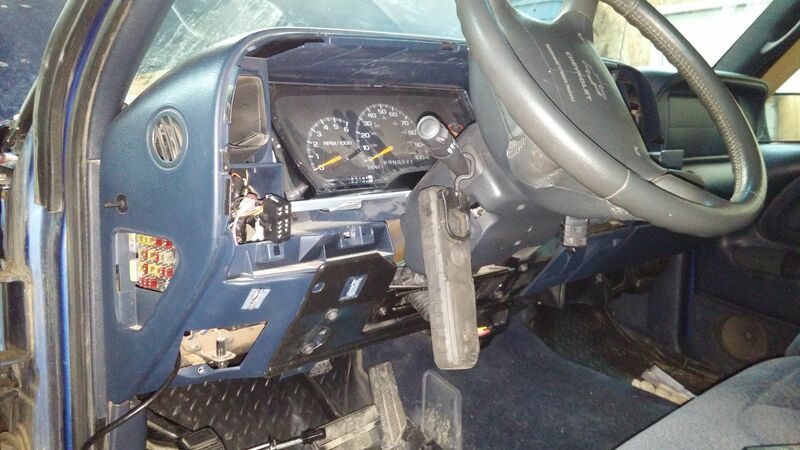 This picture show the dash bezel and a couple other pieces I removed. 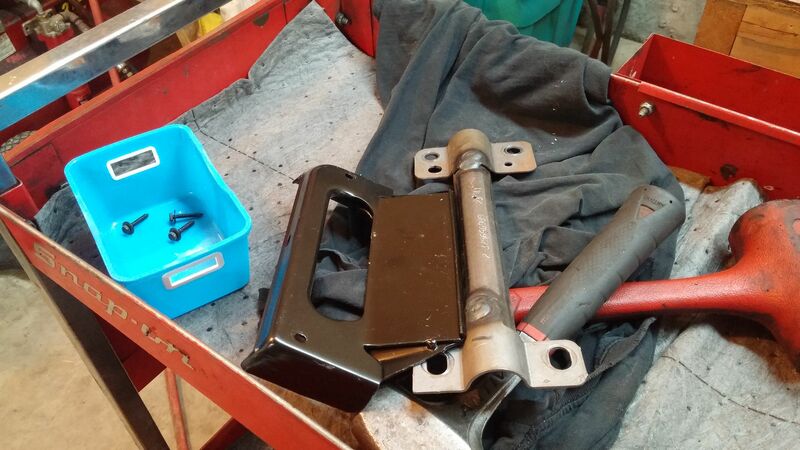 A couple more pieces that were removed before dropping steering. 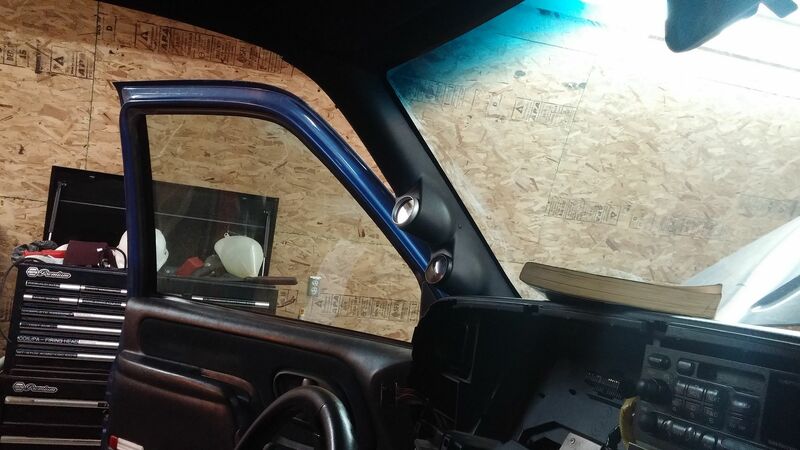 A picture of the open area I have to work with after getting the dash to tilt back. I have the pillar pod sitting in position to drill the six holes. But not tonight, I had two to many wobbly pops tonight to do that safely. There are a few things that you do not have to remove. Actually you do not have to remove the speed o meter. You do not have to remove the two screws under the speedo. YOu do not have to remove the cup holder. You do not have to remove any of the screws showing on the right side at the bottom. 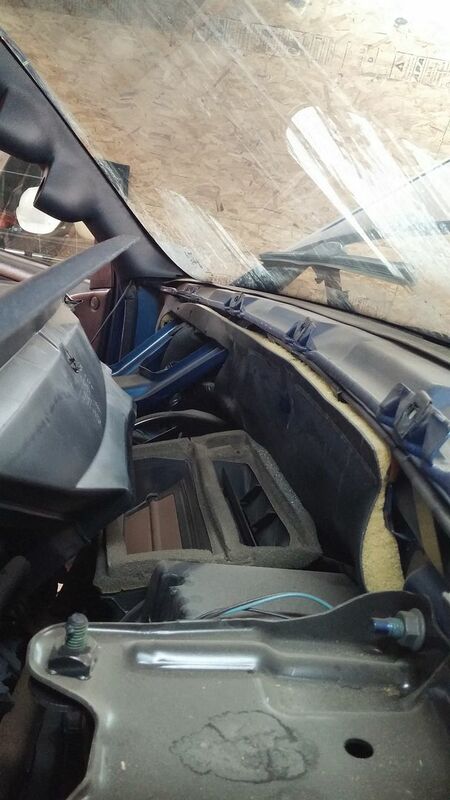 You just have to remove the dash bezel, the lower panel below the bezel, the two plates by the steering shaft. 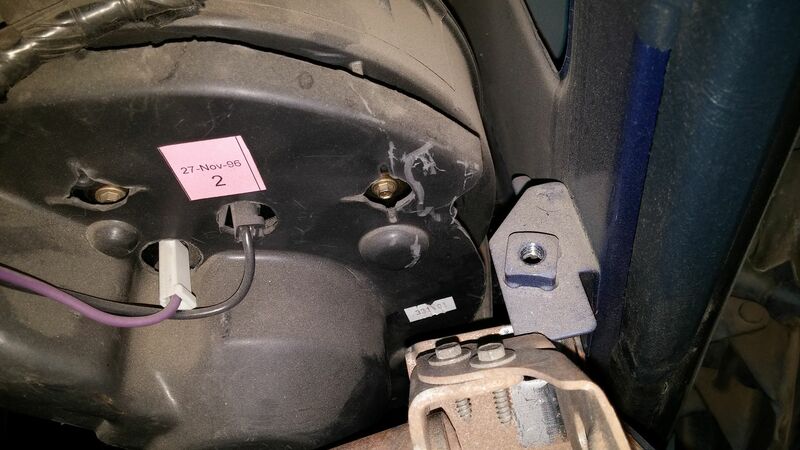 The bracket below the steering shaft, the four nuts for the steering shaft, the two 8 mm bolts on the lower right and left side, the three screws on top and loosen off the two bolts about the heater fan. Then it tilts back. 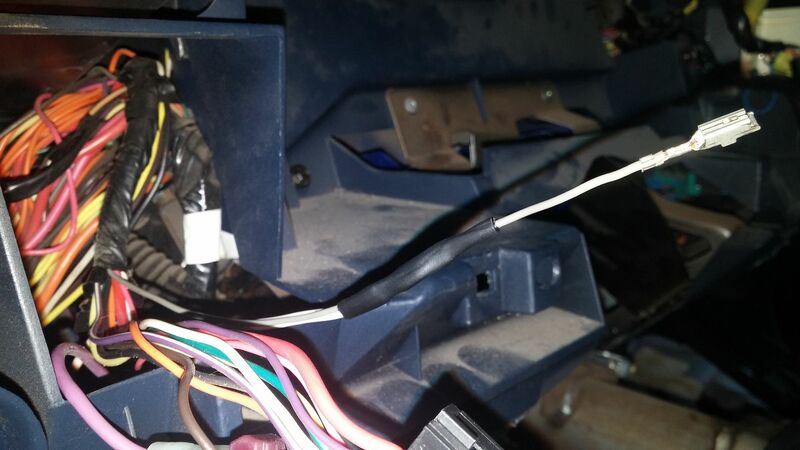 To remove it, there are some wiring connectors to remove. I am not removing the dash. This morning I removed the factory A Pillar, and drilled the holes to mount the gauge pillar pod to the factory one. Wiring in the temp gauge. I also painted the screw as they are called, to match the color of the gauge pillar pod. 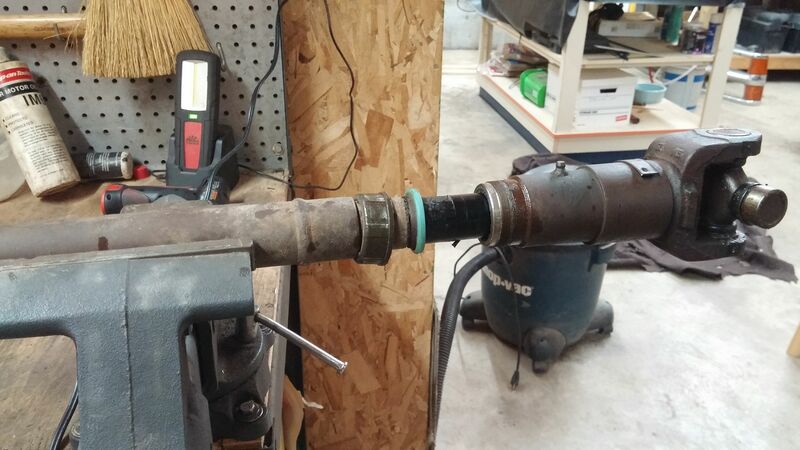 I wired up the gauge then put it in the gauge pillar then. I drilled holes into the factory A Pillar to run the wires behind it. I put the Wide band O2 sensor gauge in place and run the wires for that too. I will hook this all up another day. 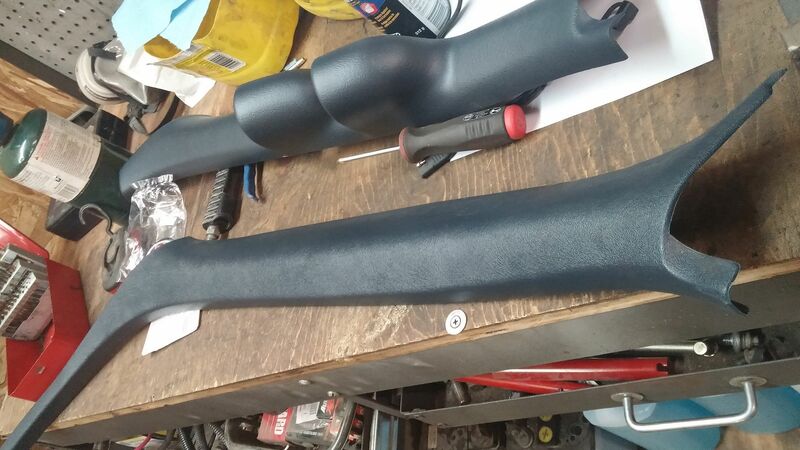 Then mounted the A Pillar to the cab pillar. Next is to find places to connect wires too. I connected the wire for the light to the gray wire on the light switch connector. I run the wire through the firewall for the temp sender. I just have to find a keyed power wire to hook up too. I know where the ground is going. 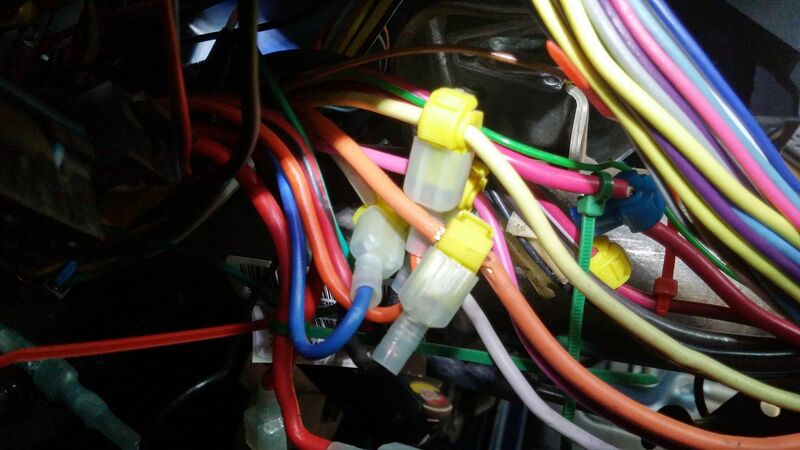 I took a picture of what was done when we had a remote control starter put into our truck. Command Start is the brand name. We had this put in in 1999. So far nothing has ever shorted out. 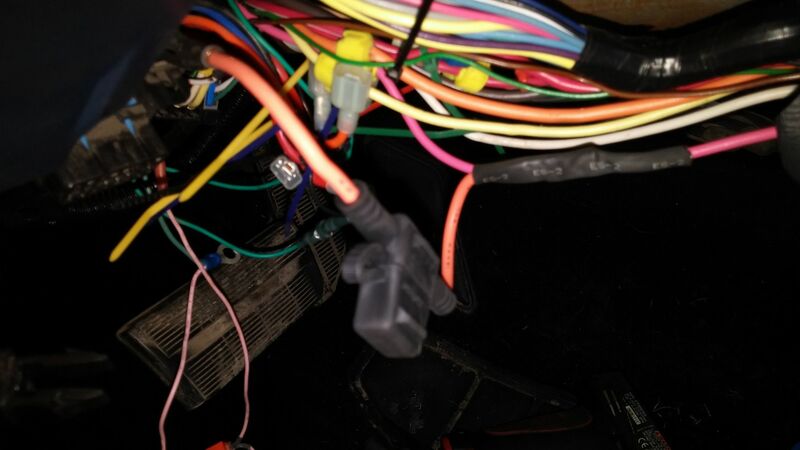 I tapped into the pink wire for my ignition wire, that is needed for power for the Transmission temp gauge. I did add a fuse in line too. 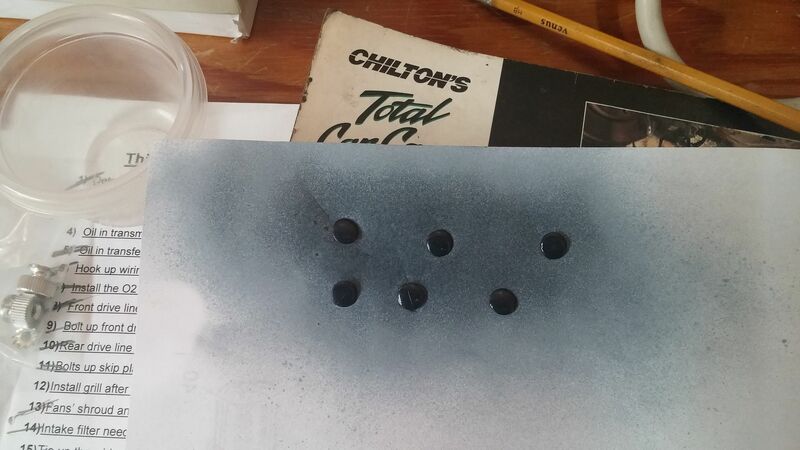 I wish I had the terminals to put in the fuse panel, there are a few blanks spots that can be used. Getting at the fuse panel is not that easy either. I broke one of my dome light switches, ordered two of them today. The left one has been acting up, since the dash is pulled back might as well change it too. I have to order another park lens. The one I did get was for the right side. I actually needed the left side. 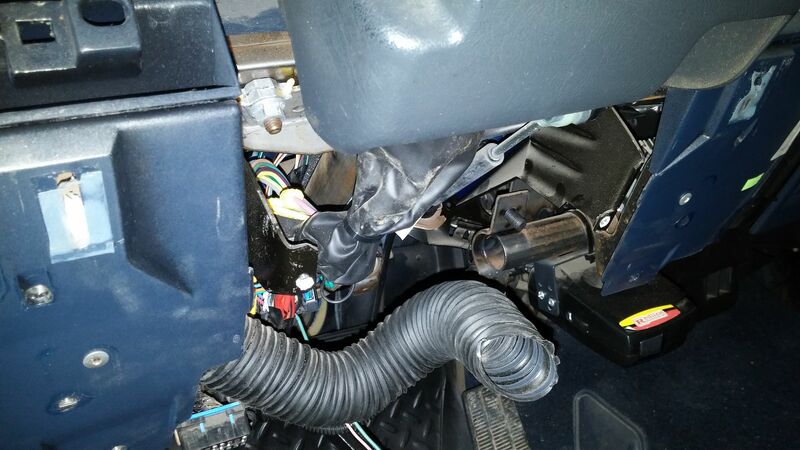 I also found the lever for opening the hood in the cab was broken. Not sure when that happened. Will address that too. I have the grille mounted up. One of the tabs for holding the lenses in place is broke. Must have had a flaw in it when I put that in new. This is the first time the lenses were off since putting it on. I have asked this on the other form I belong too. 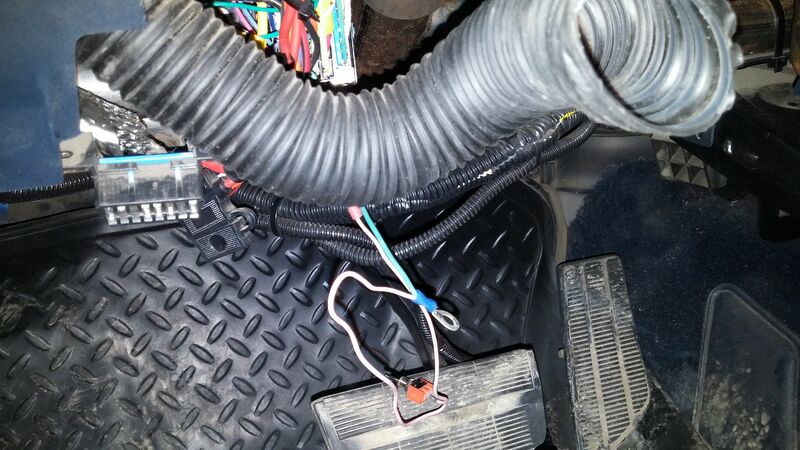 When I get ready to fire the truck up, do I need to adjust the shift cable. I see some video's on this on You Tube. Just am not sure. Since I do not have the tool for aligning the park neutral safety switch, what do I need to do to make sure it is positioned correctly? Myself, I relied on the bolt imprint on the old safety switch bracket. Right now I just went by the front bolt mark from the 4l60. I shall see how close I am. I did the same, and it seems to work well enough. However, I may need to replace mine as occasionally my shift indicator disappears, and I haven't been able to shift into 4LO ever since. I've not been concerned with it so far because I don't ever go crawling.